We are primarily an original band based out of Marietta,Ga. We sing about Love, Loss, sadness, insanity and yes redemption. all of us are over the age of 40 and prefer the same.We are acoustic guitarists/lead singer,bass/backup vocals, and drums. We enjoy live performance and recording,mostly on weekends.We are actively seeking you electric guitarist to make our music even better. We all have obligations but nonetheless we live to write sing and play and will quit when we are dead. Our arrangements are not difficult we just need an energetic new friend to fill in all the blanks with stylistic embellishments to whip the band up into a frenzy of rock n roll bliss. And the style or ethos of the band? 1. Even with their many problems of the suburbs according to critics (including a lack of community and poor design), there are a good number of music artists who have emerged from this social space in last half century. Perhaps it provides teenagers lots of time, space, and social connections for putting together a group? Perhaps it is because people in the suburbs get some decent music training as kids or have access to instruments and time? Perhaps suburban ills push people toward music as a way to escape? 2. McMansions may not be appealing to some but they offer a lot of space for music equipment and practice space. Imagine how much sound it takes to fill that two-story great room. Or the way that the loud noise of a rock band might just rattle the poorly constructed abode. Band names can often reflect societal trends so I’m not surprised that a group selected the name Big Data. I like the name: it sounds current and menacing. I’ve only heard their songs a few times on the radio so I’ll have to reserve judgment on what they have actually created. It might be interesting to think of what sociological terms and ideas could easily translate into good band names. One term that sometimes intrigues my intro students – interactional vandalism – could work. Conspicuous consumption? Cultural lag? Differential association? The culture industry? Impression management? The iron cage? Social mobility? The hidden curriculum? Up and coming Chicago area rock band recycles suburban critiques? 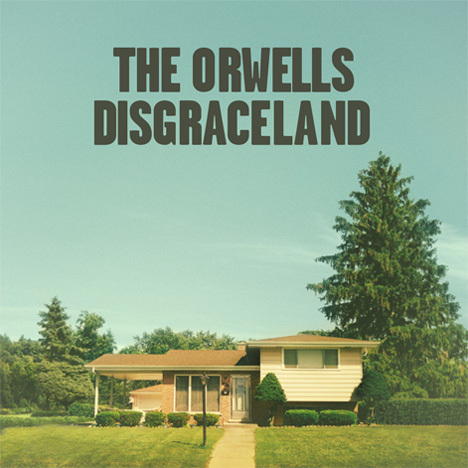 They’ve got their major-label debut, “Disgraceland,” coming out in June; its cover, shot by Eddie O’Keefe, depicts a cookie-cutter post-war Elmhurst house. A fairly typical home from the Chicago suburbs: split-level, a yard, detached garage in the back. Why the focus on critiquing the suburbs with the image and the title of the album? I listened to some of the band’s songs on SoundCloud and found the group doesn’t say much specific about the suburbs. (As for their sound, it is a mix of classic and modern rock.) Indeed, the theme of a number of the songs seems to be normal stuff for rock ‘n’ roll: how to get the girl. There is a song called “Mallrats” (with a music video filmed at Yorktown Mall) but its verses talk about a girl and the chorus has numerous repetitions of “la la la.” Of course, the new album may have more material about the suburbs. Maybe this kind of explicit sexual desire is taboo in the suburbs. Maybe the suburbs are simply boring. But, I wonder if this the new album cover and title simply mimic decades-old critiques of the suburbs as too confining for rock music. Does the album contribute anything new or unique about suburban life? The profile of the band suggests the members had a pretty good family life with plenty of ongoing family support plus good educations. Were the suburbs really that bad or is this a simple way to show the band is turning away from the stereotypical clean, comformist, and dull suburbs? If so, they are in a long line of writers, artists, filmmakers, and musicians. 1. Lewisohn does a nice job discussing the more mundane aspects of their early life such as the home life of each band member. They came from a range of working to middle-class families with several from the Liverpool suburbs. Additionally, until 1962, several Beatles had to have regular jobs because the music business wasn’t yet working out. If I remember correctly, both Ringo and George worked as apprentices in certain trades while Paul worked in various delivery and clerk jobs. It is hard to imagine the Beatles in these roles but they had to balance a normal life path (as some of their family members reminded them) versus trying to succeed in music. 2. Like others, Lewisohn highlights the importance of the band’s early stints in Hamburg. However, he clearly drives home the point that this is where the true Beatles emerged. Not only did the band have a lot of time to play and hone their craft, they also took advantage of this: they knew they had to become serious about their music in order to get ahead. In other words, they went to Hamburg as just another band from Liverpool and came back and blew everyone away with their music, image (black leather), and confidence. 3. There is a lot of emphasis in the book on the larger music scene in England – which was fairly nonexistent regarding rock and roll. The Beatles were quite good at tracking down American music and they were heavily influenced by black artists like Little Richard, white artists who played black music like Elvis, and musicians who emphasized the band like Buddy Holly and the Crickets. The Beatles liked a broad range of music, which helped give them plenty of music for their long sessions on stage in Hamburg but also set them apart from other Liverpool bands who stuck to more tried and true songs. When the Beatles were in position to record auditions, the music labels weren’t really looking for full bands like them that sang in harmony, emphasized the group rather than the lead singer, and wrote some of their own songs. It is interesting that they ended up with a fruitful working relationship with George Martin at Parlophone as Martin had an eclectic career himself producing a wide range of albums and having difficulty getting a #1. 4. From the beginning, the Beatles wanted to be rich and famous. Perhaps it was simply the brashness of youth. Perhaps they wanted to escape humdrum Liverpool. It is not necessarily clear that the natural talent was there early on to back these ideas up: the Lennon-McCartney classics didn’t really start flowing until 1962 (plus bands didn’t a whole lot of this themselves at this point), John was creative but not always pleasant or focused, they weren’t the greatest musicians early on (especially with Paul learning the bass – though he became good quickly), couldn’t settle on a good drummer until Ringo was asked to join, and some of their early shows/auditions were marked by nervousness. But, it eventually came together in a product that was quite different from other music options and that propelled them ahead of other bands that were once their peers. This book is full of details in its 800+ pages such that even as it covers similar ground as other biographies, it helps show how the mundane became extraordinary by the end of 1962. I’m looking forward to the next two books which should help reveal how the band that led to Beatlemania entered their most creative period of songwriting, transforming the music and recording industry, and maturing. Here is an interesting musical argument: among the world’s best-selling music artists, Britain is represented by bands while the United States has mainly solo artists. That fact conforms a rule that becomes more and more noticeable the further down you look on the list of the greatest-selling artist of all time: The biggest bands in the world are British, and the biggest solo artists are North American. But an arguably sturdier explanation lies in the way those first two giants, Elvis and The Beatles, influenced listeners, musicians, and recording industries in their respective countries. The most-talented aspiring artists on the east side of the Atlantic, from Bono to Freddy Mercury, wanted to be in a band like the Beatles. In the States and Canada everyone from Madonna to Michael Jackson wanted to be the next King. I’m not sure I buy this final argument. After all, a number of these important early British bands like The Beatles and The Rolling Stones learned much of their craft from American solo artists like Elvis, Little Richard, Muddy Waters, and others. Every artist in America wanted to be Elvis and every British artist wanted to be like The Beatles? Another aspect of this is that even solo artists need backing bands and collaborators. It is not like the solo artist does everything alone even if they get much of the credit. Additionally, many bands have more dominant and less dominant members. Many bands have struggled with this as members vie for attention. In the end, perhaps this is more about notions of who gets to take credit for musical achievements: the front person or the collective? This topic seems ripe for more prolonged study. This argument is based on the top 20 artists of all time and perhaps represents a statistical anomaly compared to a broad slice of chart-toppers. And why not expand the study to other countries who might have even different musical cultures?